Born too late to study with Sam Hyde Harris or Edgar Payne? 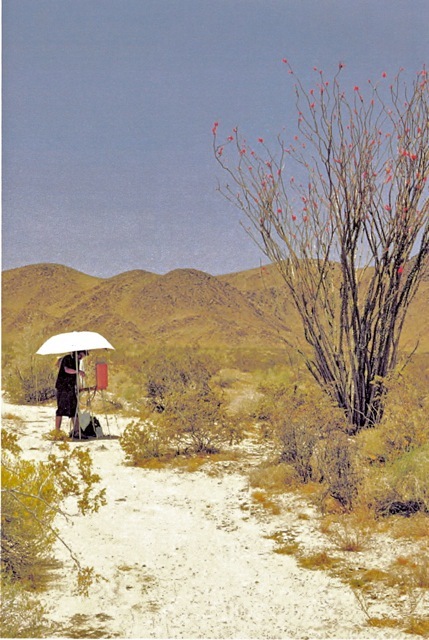 Now you have another chance to learn from a traditional California master, when Eric Merrell teaches a painting workshop in Joshua Tree Sept. 19-23, 2011. Limited to just ten students, the class costs $500 for five full days of painting. Students are responsible for their own accommodations and supplies. While Merrell is only 33, he has the soul and drive of an early landscape artist. As the historian for the venerable California Art Club, he also knows a lot about the famous painters and will undoubtedly entertain his students with their stories. Merrell contributed to California Light, the big new history of the Club. The Rosemead-based artist has painted all the California classic subjects—Yosemite, Big Sur, adobes—and is especially known for his work in the desert. The Forbes Gallery in New York City recently exhibited his paintings from an artist’s residency at Joshua Tree. And his Salton Sea paintings appeared in the Valley of the Ancient Lake exhibition at the North Shore Yacht Club. 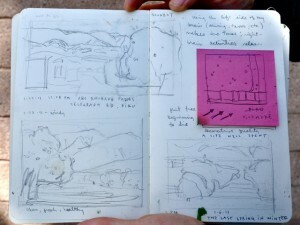 Eric Merrell's sketchbook. Photo by Christy Porter. Like the early artists, Merrell spends long hours outdoors and never paints from photographs. 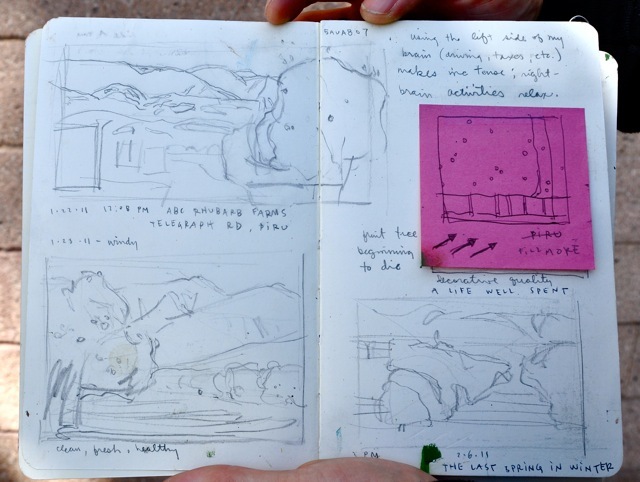 He keeps a detailed sketchbook of his wanderings, and stays cool in the desert by stuffing frozen water bottles in his pockets. If you aspire to be a Calfornia master, there is no substitute for hanging out with a guy like Eric Merrell.